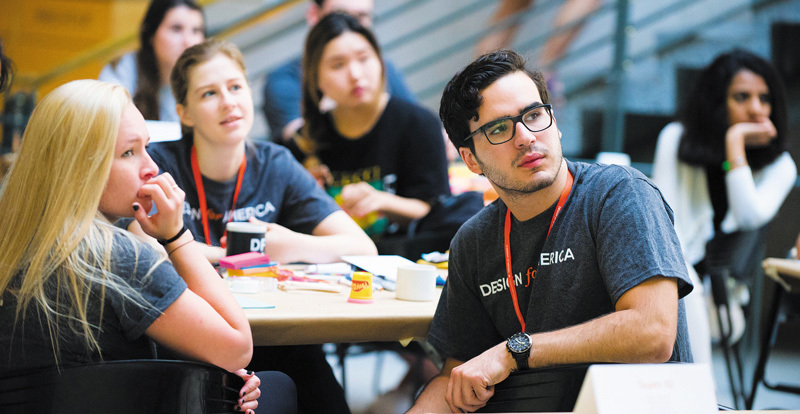 Northwestern's 2017 Design for America Leadership Studio Challenges 106 students to create solutions inspired by the difficulties community members face. Participants talk about Design for America and their experience at the 2017 Leadership Studio. A grassroots, student-led network, FDA began at Northwestern in 2009 and has spread across the nation to 37 universities, including Stanford, Massachusetts Institute of Technology, Carnegie Mellon, and Yale. More than 1,300 students are now involved with the organization, where they assess challenges using a human-centered design process and work collaboratively to implement solutions. For Octra Edwards, the simple act of grocery shopping can present frustrating challenges. Although wheelchair ramps and accessible restrooms have become more prevalent than ever, America’s cities still have a long way to go to becoming welcoming and safer to people with diverse accessibility needs. By sharing her story with students at the eighth annual Design for America (DFA) Leadership Studio, Edwards hopes her struggles will highlight some of the more overlooked needs and spark new solutions. Held the first weekend of August on Northwestern’s Evanston campus, the 2017 Leadership Studio welcomed 105 students from 33 universities to learn about design, social innovation, and creative leadership. Sponsored by 3M, The James Dyson Foundation, Shure, and Sodexo, the event challenged students to use design innovation for social good by developing solutions that could improve accessibility in urban areas. After meeting and talking with several community members, including Edwards, Leadership Studio participants brainstormed and prototyped accessibility solutions in a two-day design sprint challenge. The sprint culminated in a Project Expo, where teams presented their solutions to an audience of community members, business professionals, design experts, Northwestern faculty members, and DFA staff and alumni. Instead of organizing items horizontally on shelves, Vertishelf displays items vertically. In a typical store, for example, one shelf might hold only milk, another yogurt, and a third cream. Using the Vertishelf method, the students proposed placing a number of cartons of milk, yogurt, and cream on all three shelves. Another team presented a new art immersion experience designed for people who are seeing or hearing impaired. Their proposed gallery, called Enhance, included multi-sensory experiences, featuring more audio and tactile pieces.